Do you like the idea of journaling but are too lazy/lacking in will power to write it up everyday? Me too! For the past few years I’ve made myself a really easy journal that takes seconds to fill each day. It’s based on this Instructables tutorial by Faitmain-Faitcoeur. This journal doesn’t require any writing or deep thinking. All you need are receipts, tickets and other mementos, which get filled into an envelope each month. 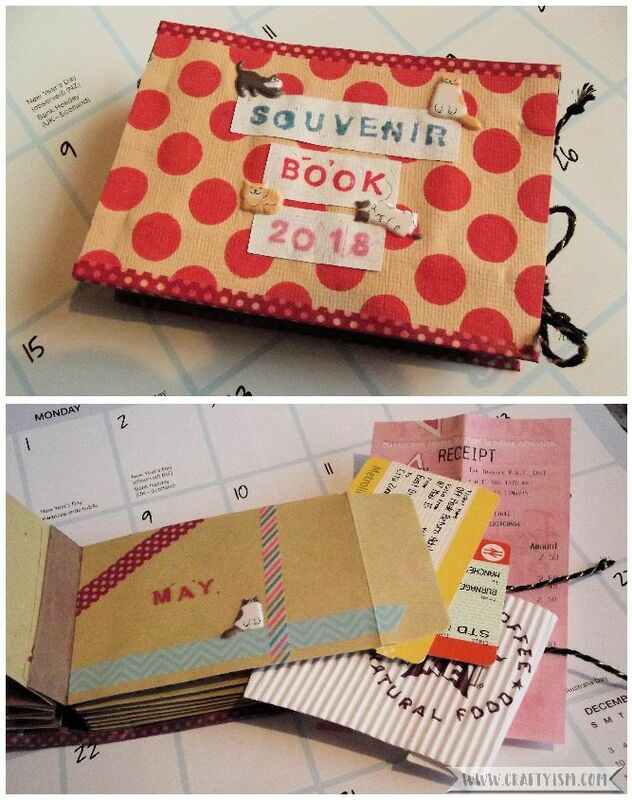 At the end of the year you will have a chunky, visual journal with physical reminders of what you’ve done and where you’ve been throughout the year! 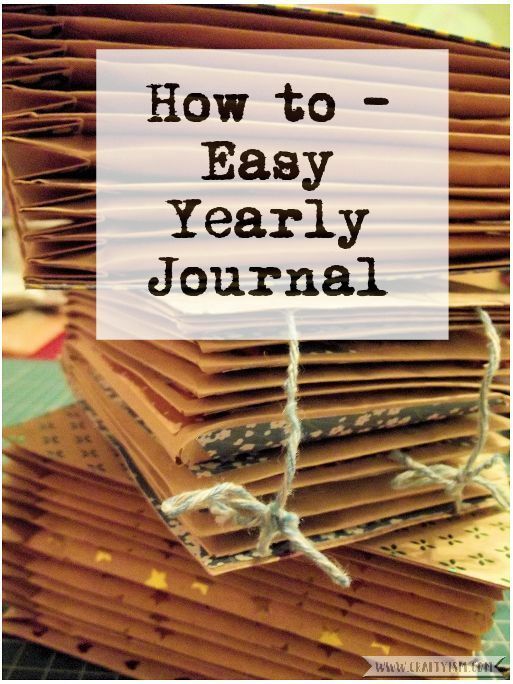 So why not make 2018 the year you finally keep a journal and follow along on your first steps of easy journaling. First of all, decorate your 12 envelopes. You can do this randomly, or use a theme. My theme this year is bold coloured Washi tape and cat stickers! 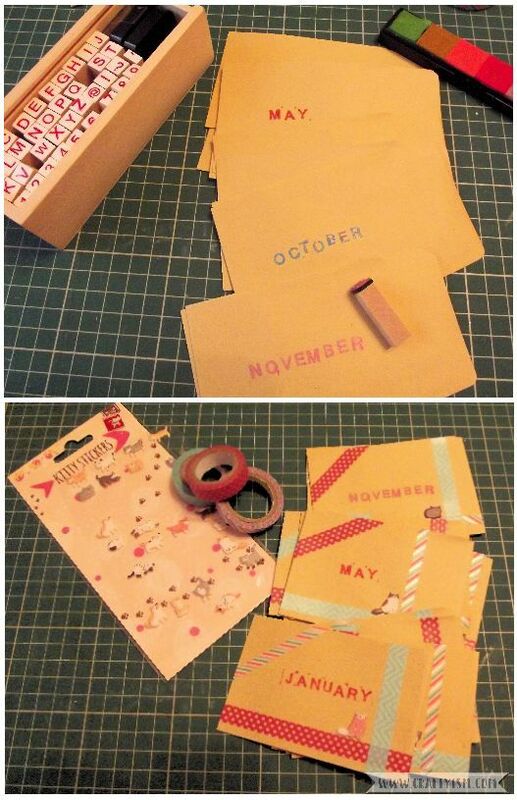 The most important thing is to mark each one for an individual month. Also make sure the opening of the envelope is on the right hand side. I have included some images of how I have decorated my envelopes in previous years for inspiration. This bit involves a bit of maths. 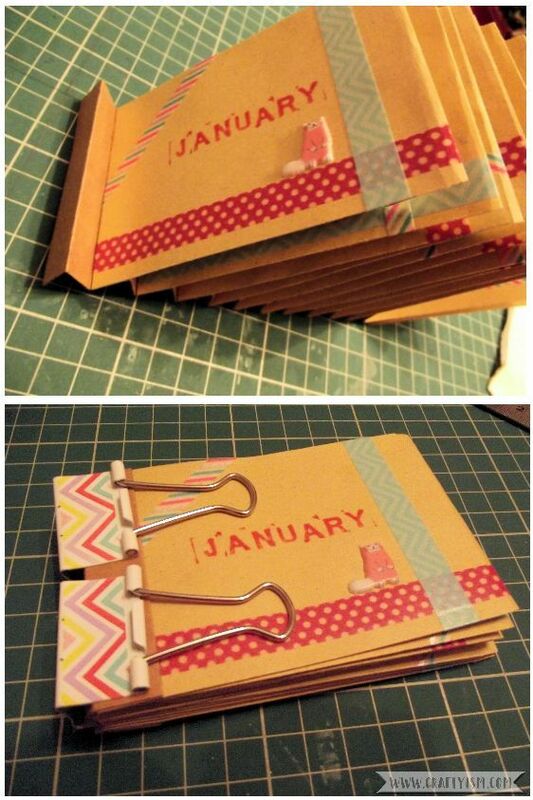 Your envelopes will be attached to a concertina of card so that the journal can expand as you fill it. Each envelope needs two sections of concertina measuring 1.5cm each. You also need one extra section to attach the cover to. For a 12 envelope journal this means you will need 25 concertina sections. So the length of the concertina is 25 x 1.5cm = 37.5cm For the width of the concertina, measure the height of your envelope. My envelopes are 7cm high so on a piece of card, I draw a rectangle 37.5 x 7cm. Before you cut this rectangle out, make a mark along its length every 1.5cm. Then score from top to bottom at these marks. These are the concertina sections you will fold. 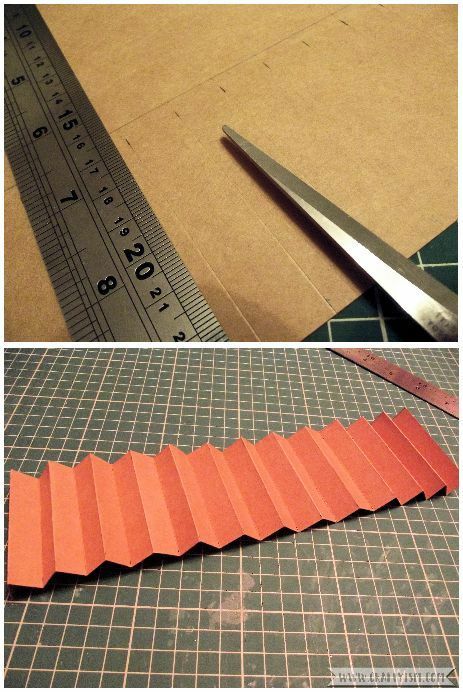 Cut out the rectangle, then fold along the scored lines to make a concertina. Now to attach the envelopes to the concertina. The envelopes will be glued onto the right hand side of the concertina using a thin layer of white glue. Start from the back and work in reverse order, starting with December. You can follow the pattern in the images above. When you’re finished, you should have one section at the front without an envelope. This is where the cover will go. It’s important to be quite careful with your glue, or you could end up gluing your concertina shut! When you’re finished, used bulldog clips to clamp shut the concertina whilst the glue dries. Two of these will be the endpapers of your journal. You can cover them on one side with coloured paper if you like. The other two rectangles will be the front and back covers of your journal. These can also be covered in coloured paper on one side. I also added a title and some more decoration to the front cover. Next is attaching the endpapers. Take your concertina of envelopes and spread some white glue onto the empty concertina section above the January envelope. Stick on your endpaper, colour side down. Make sure to position the endpaper so that it completely covers the envelopes and concertina. Repeat this at the back, gluing the concertina that’s on the back of the December envelope. Clamp together again with bulldog clips until dry. To make the fastenings that will hold your journal shut, use some thin string or ribbon. You will need to cut two pieces. To work out how long the pieces need to be, use the measurement for the length of your cardboard cover x 2 + 25cm. So I cut two pieces of string measuring 47.8cm each. 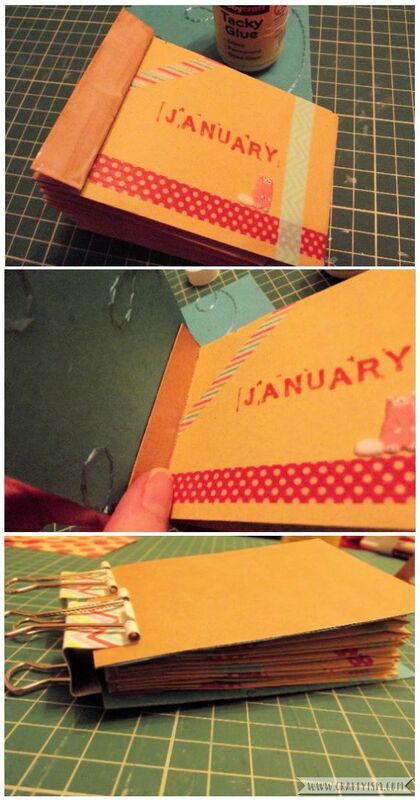 Place a strip of double sided tape along each edge of your endpaper, and one in the middle. Take one of your strings and line up your mark against the right side edge, about 3cm from the top. Stick the string in a line across all the tape. Do the same with the second piece of string at the bottom of the end paper. Repeat these steps on the back endpaper, pulling the strings around from the front. Make sure not to tangle the strings. Lastly, stick on the front and back covers. Take the decorated front cover and spread a generous amount of white glue onto the reverse. Stick this to the front of the January side endpaper over the taped down string. 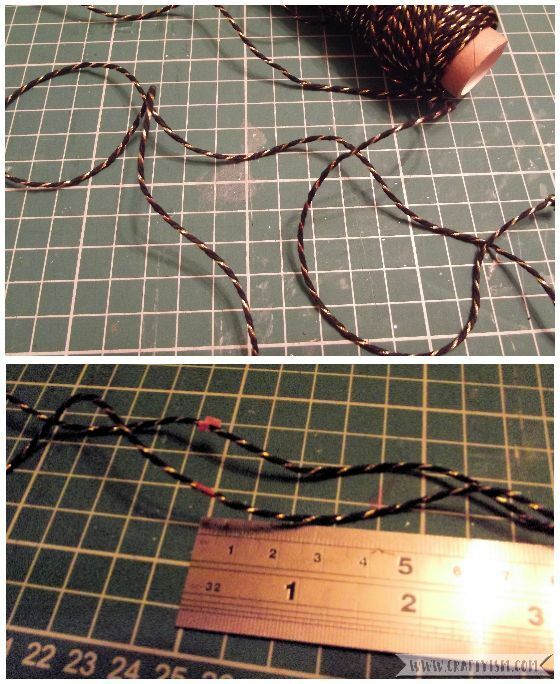 Make sure to line up all the edges and leave the two ends of string free. Repeat for the back cover and apply as many bulldog clips as needed to everything stuck together. 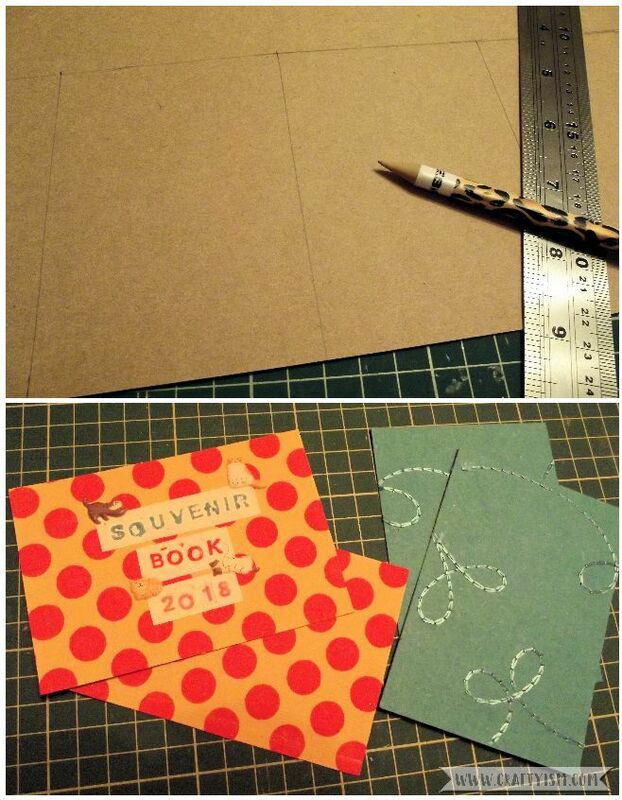 You can also place a heavy weight on top of the finished journal to keep it flat until it’s dried. You can use any sized envelopes to make this journal, so it can be as big or small as you like. It can also contain more or less envelopes, just remember to adjust the size of the concertina. How about making a baby’s first year journal, or a wedding planning journal? Just change the titles on each envelope to suit the different categories of collectables.